Approximately 6.8 million adults, or about 3.1% of people age 18 and over, have generalized anxiety disorder in a given year. Approximately 5.3 million American adults ages 18 to 54 suffer from social phobia. A study by the Boeing Aircraft Company determined that one third of all adults are afraid to fly, and half of those avoid flying altogether or suffer actual panic attacks if they must fly. The important thing to remember is that fear is prevalent and powerful and can hold us back, but it is also manageable and conquerable. Gloria Boileau is a life-long seasoned professional speaker, executive coach, and fear wrangler. Having grown up in a household that could have left her consumed by a life of fear, Gloria realized it was up to her to conquer her life challenges. In her journey for self-preservation, Gloria has studied her own fears and the fears of others. She is a highly sought after expert, communicating with people about their fears and helping people learn how to Stop the Fear. 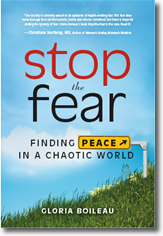 When is Fear Appropriate & How to Make Your Fears Work for You? to contact us at 858.550.0151.